A well maintained patio is the ideal place to relax and get maximum enjoyment from your garden and any warm summer weather we might be lucky enough to have. Give your patio a good sweep with a yard brush whenever you see a build-up of leaves, dirt and debris. Decaying leaves can leave permanent stains on concrete and paving, and wet leaves can also be hazardous to walk on. As the leaves fall in autumn, a leaf blower can be a useful tool to keep your patio clear. Spring is the ideal time to give your patio a good clean; the worst of the weather has come to an end and it will make sure your patio is ready to use as soon as the good weather arrives. A pressure washer, also known as a power washer, is an efficient way to clean most types of paving. Please follow the instructions of your paving manufacturer or supplier as some low-cement, cast and natural stone products will require low-pressure cleaning with a regular hose and brush to avoid damage. Choose a pressure washer nozzle that provides a strong stream of water to remove stubborn algae and moss, but do not point it at the one spot for too long as this may cause damage. You should wear safety goggles and gloves while doing this job, as pieces of debris may fly towards your eyes. If you have neglected your patio for some time it may be necessary to use a suitable outdoor detergent to remove stubborn stains, e.g. Patio Magic or Jeyes Fluid. Apply as directed by the manufacturer’s instructions. Pressure washing can roughen surfaces which can encourage the regrowth of algae and moss; you can counteract this by using a fungicide detergent that will kill moss, algae and mildew. If you remove the sand between the joints while power washing, replace it with an appropriate sand or patio joint filler. This will prevent weeds from growing in the joints of your patio. Watch out for large cracks forming in the paving, as they will allow water to penetrate the concrete and erode it. Filling the cracks with a concrete patch product is quick and easy and will prevent massive repair work in the future. Ideally, after washing your patio you should let it dry completely and then seal it to waterproof it and prolong the results of your cleaning efforts. This step is important and often overlooked. It helps prevent erosion of your paving and improves its resistance to dirt and stains. Many sealers will also enhance the beauty and colour of the paving too. Apply the waterproofing sealer to your dry and clean patio, following the manufacturer’s instructions. Look out for any small signs of wear on your patio furniture that may be easily repaired now. Large cracks or other structural defects can pose a danger to you and your guests and these items should be replaced. Plastic and synthetic rattan furniture on your patio can be cleaned with a power washer, while wooden and metal furniture should be hand washed. After cleaning and drying, wooden furniture should be treated with a wood preservative or varnish. 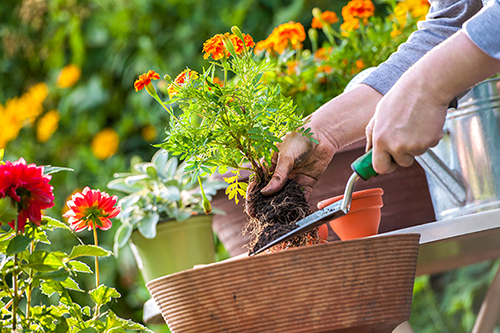 Remove and discard any of last year’s annual plants, as well as any weeds of course, and refill with new compost and flowers. This will freshen and brighten your patio for spring and summer. Tidying away tools and equipment into your garden shed will help create a relaxing environment. Clean, treat and paint any fences, walls and sheds in your patio area to avoid being reminded of the jobs that await you as you try to relax! Lastly, why not show off your patio by hosting a barbeque for family and friends; see our guide to preparing the perfect BBQ here.